The PVT counts weren’t included in the 1972 count, but it does explain big jump in the total head count between 1972 and 1974. These counts are usually from the first of the year. The off-range numbers begin in 2000, about the time the Wild Horse & Burro population spiraled out of control. By 1976 the total head count had nearly doubled and Congress realized they needed helicopters for gathering the horses and motorized vehicles to transport them and changed the Wild Horse & Burro Act of 1971. Even Wild Horse Annie recognized the need for gathers and removals. By 1980 over 43,500 head had been removed from the range leaving 64,500 on the range, 2.5 times the on-range number in 1972. The counts have been close, but not under AML since the program began. In 2000 the off-range numbers are first reported, starting with 6,086 head and growing to 46,538 in 2015. At the same time removal numbers dropped from 13,000 + to 3,800 head in 2015 with a low of 1,857 head in 2014. In the same period adoptions dropped from 11,764 head in 2001 to 2,331 in 2015 with a low of 1,789 adoptions in 2014. With the big drop in adoptions the program is in real trouble! These numbers show it has been a real struggle for the BLM to keep population from shooting up. Since 2000 removals has been down for two reasons, they don’t have the money to place more horses in storage and have limited funds for gathers. Since 2007 the horse populations on the range have doubled. In 2005 the Burns Amendment changed the Wild Horse & Burro Act of 1971 to allowing excess horses or burros to be sold without limitation. Unfortunately, Congress immediately blocked sales without limitation through a rider on an appropriations bill. Had the BLM been allowed to sell 7 to 8 thousand head of horses or burros every year for the last ten years we would be at AML on the range with few horses or burros in long and short term storage. As it stands now, we have 80,000 + excess horses and burros, that should have been sold without limitation. There are 10 million head of horses in the United States. The U.S. Government does not need to be raising and placing excess horses in long term holding facilities. 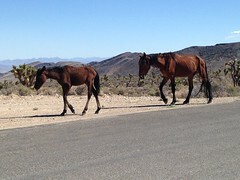 The solution to excess horses and burros on the range is easy to see, easy to do and will drastically lower the costs of the Wild Horse & Burro Program. It is as simple as selling the excess horses.